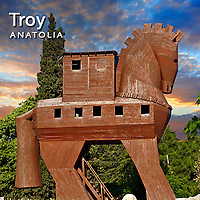 Pictures, images & photos of Troy Archaeological site, Turkey. Troy was the setting for one of the great Greek tragedies Ancient Greece. According to the legend the goddesses Athena, Hera and Aphrodite quarrelled over a golden apple known as the Apple of Discord which was to be given to the fairest goddess. Zeus sent the three goddesses to Paris to decide and he chose Aphrodite to be the fairest. In return she made Helen, wife of Menelaus fall in love with Paris and he eloped with her to Troy. Enraged, Agamemnon King of Mycaenae and brother of Melaneus raised an army to besiege Troy and get Helen back. Agememnon besieged Troy for 10 years during which time many heros like Achilles, Ajax, Hector and Paris himself were killed in battles but Troy did not fall. Then the famous wooden horse of Troy was built and the ruse led to the downfall and destruction of the city. The Torjan war supposedly happened in the 12th or 13th cent. B.C which makes the archaeological site of Troy very old indeed. It therefore does not have the great buildings of later Greek & Roman cities and is still very much work in progress. In 1870 German archaeologist Heinrich Schliemann excavated the site and his trench across part of the site exposed layers going cake to the period of the Trojan War which were charred from a great fire. After a century of controversy most scholars today agree with Schliemann that the ruins are those of Troy.